SVEDKA Vodka, today launches its first national brand campaign in over five years. The brand's new integrated marketing campaign features the call-to-action of "Bring Your Own Spirit" and will include TV commercials, creative digital marketing and social media content. 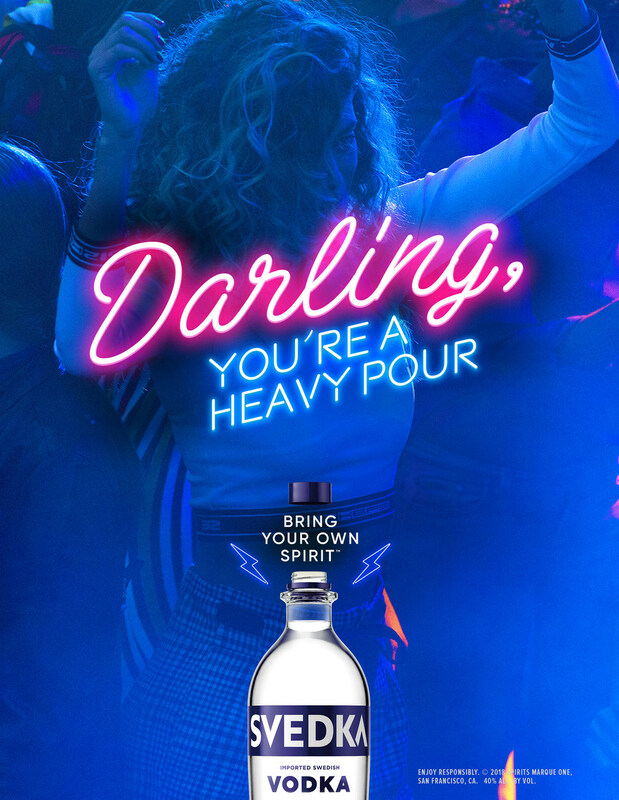 SVEDKA's new "Bring Your Own Spirit" message channels its original and energizing brand ethos through vibrant imagery, captivating content, and declarative language. The 15- and 30-second TV commercials showcase an eclectic and energetic cast, bringing their own spirit to the occasion and living their lives with authenticity, diversity and originality. In its digital ad creative, the brand speaks directly to its bold consumer through powerful visuals and dynamic language: "All Heart Eyes on You," "Exist Loudly," "Darling, You're A Heavy Pour," and "You're A Rainbow & They're All Colorblind." "We believe that the brand's new 'Bring Your Own Spirit' platform represents the consumer of today - one that is fearlessly original, has a distinct point of view, and makes no apologies for who they are or what they do. This campaign showcases the dynamic energy and sense of place that connects the consumer intimately with the SVEDKA brand, creating a tangible sense of good times in the immediate future." TV commercials will commence today on U.S. cable networks including; Bravo, ESPN, USA, E!, Comedy Central, among others. Following broadcast, digital marketing and social media ads will roll out across Facebook and Instagram through Spring 2019. Digital platforms will be a critical media vehicle to communicate the brand's message through banner advertising and interactive content opportunities that allow the consumer to click through to SVEDKA's brand site and explore the brand and "Bring Your Own Spirit" in its entirety. "Bring Your Own Spirit" was created, directed and edited by SVEDKA Vodka's creative agency of record, R/GA: Todd Sullivan, Managing Director, Client Services; Tim Hogan, Creative Director; Nathan Kraft, Group Director, Connections; Julie Benevides, Senior Content Producer and Catherine Hughes, Executive Producer.